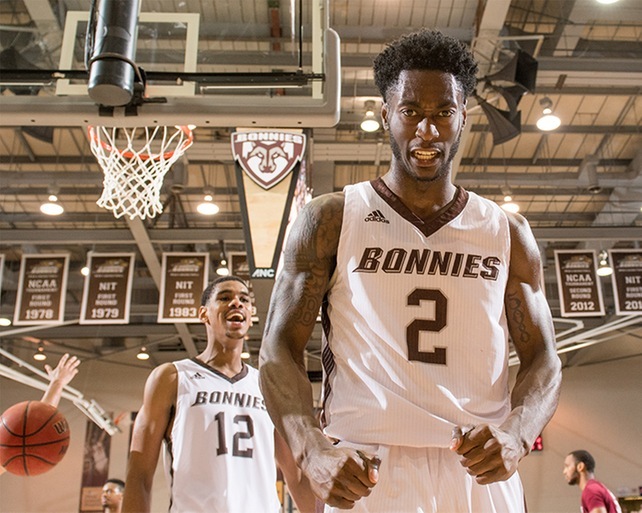 In perhaps the most anticipated season in modern Bonaventure history, the first seven games have been filled with just about every emotion one usually experiences in a 30 game season. After a tough loss against Niagara, the team has rebounded nicely to move to 5-2. While there’s still quite a long way to go, some trends worth noting have already emerged. I’ve never believed in sugar coating any analysis. This article is no different. I just calls ’em like I sees ’em. Let me know if you agree, disagree, or anything in between. I’ll be the first to admit that I was wrong about Griffin. After his freshman season, I was hoping, at best, that he would develop into a plus defender. After scoring 77 points all season in 2016, he has already scored 73 in 2017. His dribbling has improved, he finishes more consistently at the rim, and he has even developed some moves around the basket. And of course, there are his dunks. LaDarien’s improvement should give hope to any freshman, *cough* Chef *cough*, who feels trapped at the end of the bench. Keep eating, LD. He hasn’t always been perfect, but Brockington has rightfully gained playing time and trust from a coach that is on record as saying he doesn’t like to play freshman. He is an aggressive on-ball defender, with quick hands, long arms, and the ability to always create a turnover. More surprising, has been his offensive game. He has shown an ability to finish off-balance layups, especially in transition, as well as being able to hit the long ball. Even in a poor shooting night against Siena, he showed maturity by not forcing any shots. He has already proven to be better than I anticipated, and may prove to be another one of Schmidt’s recruiting steals. Let’s agree to forget the Niagara game where the Bonnies were flat from the tip to the final horn. After that, they have come to every game ready to play and aggressive from the start. This is a refreshing trend from a team that buried itself in deep holes early in games last season. Credit to Schmidt for having them ready to play, and credit to the players for shaking off a brutal home opener. We know what he did against Maryland to seal the win. We know that he has provided some much need scoring to a team that was struggling to create offense in Jaylen Adam’s absence. But how about Stockard’s work on the glass? He currently has the second most rebounds per game (6.2), and most of them are highly contested. He may be 6-5, but he plays much bigger, which gives me confidence that he could play the 4, or at least take some minutes from other big men (more on that later). I guess this is more about AD Tim Keeney than it is about the team, but the schedule this year has been exactly what I have always hoped for. I would much rather lose to TCU than beat Maryland Eastern Shore. It teaches you how to score against competent defenders, guard bigger, better, and faster players, and most importantly, it gets you ready for the A10 season, and tournament. Love it. There’s not much of a market for a big man who can’t finish, can’t rebound, can’t play defense, is always in foul trouble, and turns the ball over profusely. And now, for the first time since he showed up in Olean, he’s lost his touch from midrange as well. Don’t get me wrong, I LOVE Ayeni’s heart and hustle, but emotions (as they so often do in college basketball), can’t cloud judgement on skill. Seriously, he is comically bad under the basket. I just don’t understand how someone can miss so many layups. In addition, one plus attribute that he had last year, an 80% FT percentage, has dropped to 65% this season. To contribute this season, I think he should just set-up shop at the elbow and take the open jumpers. Maybe he could contribute as a six man to provide quick offense? I have always thought Josh would develop into a useful A10 big man, and I still believe he has the potential to do so. But right now, that seems like a large leap. I have never been a fan of the high ball screen. I know it sometimes leads to some space for Mobley and Jay, but it’s more effective to make good passes to create space. For a time during the UB game, you could see that effective passing at work. Pulling the big men up to the top of the key usually only creates moving screens. We’ve got to be leading the NCAA in those right? Stop with these useless screens, and use the offensive weapons you do have, especially Jay’s passing, to create opportunities for the rest of the team. I know what your thinking. “But Taquee is a junkyard dog. He doesn’t need to be a plus offensive player to help them win.” I can see that logic, IF when Taquee does shoot, it’s high percentage shots that he routinely makes. His shooting percentage is staggeringly low for someone who mostly shoots layups and short, midrange jumpers. An offensively challenged player gives the opposing defense one less man to pay attention to when they are trying to contain Mobley and Adams. It’s pretty clear that the ball moves better with Stockard or Brockington on the floor. Taquee is still a leader of this team, and I’m not trying to say he should lose all of his PT, but 2 points in 30 minutes (not that rare of an occurrence) is unacceptable. I know, I know, Chef’s good game came against Maryland Eastern Shore. But, it’s not like everyone on the court has shown that type of ability at ANY point in their careers. There is no reason not to at least give him a shot, especially when other players are struggling. He might make some freshman mistakes, but it’s unlikely that he could provide less output than either Ayeni or Taquee have provided lately. The only way to know what you have with Chef, is to give him a chance. Duh. Not much analysis required here. The Bonnies have to be better inside if they want to beat Cuse, Rhody, VCU, etc. Although their rebounding was substantially better against UB, only 10 of their 50 rebounds came from Ikpeze, Ayeni, or Gueye. On that note, those three also managed to commit 10 fouls in 32 minutes of game action. If the big men can improve, this team’s ceiling will be much higher. Overall, I think there is a lot to be excited about for this year and beyond. I didn’t even mention that Mobley has been stellar or that Adams finally returned to action today. What I think makes this team intriguing is that they haven’t even come close to reaching their full potential. The team will only get better as Adams gets more comfortable, LaDarien and Isaiah continue to improve, and they learn how to win close games like they did in 2015-16. As a loyal Bonnie’s fan (along with being an Indians, Bills, and Sabres fan), I was hesitant to buy into the hype at the beginning of the season. I’ve always thought, if you’re that good, prove it. The next 5 non-conference games will be their chance to do just that. Good analysis, especially Ayeni….. In the off-season, they tried to get him to work the rim, but clearly he is uncomfortable there, yet he has that excellent elbow shot. I think they will change to Ikpezi and hope for the best. He does have that lovely little jump hook.